Do you like Indian food? About 13 years ago, I used to work at this job with an older Indian woman named Anna. She was a vegetarian just like I was. She used to bring her lunch every day and would often share it with me. I think she felt bad for me because I would often bring canned food for my lunch. I wasn’t much of a cook in my early twenties and I often relied on Amy’s soups and chili. Anyway, her lunches were always so good and this Potato and Green Pea Masala reminds me of her. My husband came up with this dish from ingredients we had to use up in the pantry. He is the creator of many of the savory dishes on the blog. A few of his others are: Sweet Potato Chili, Black Bean and Corn Salad and Pumpkin Enchiladas. If you are new to Indian food, this is the dish to try. The flavors and spices are pretty mild. It’s a very inexpensive dish to make. Very budget friendly. If you have been wanting to try Indian food, this is a great recipe to start with. Boil the potatoes for about 5-7 just to soften them. In a saute pan , cook the onions and garlic on medium high to soften them. About 7 minutes. Reduce heat to medium and add the rest of the ingredients, including the spices, and cook for another 5 minutes. Remove from heat and serve immediately or refrigerate for later. You can find garam masala at most health food stores. You can also check your local international market. Since it's not an item I use often, I buy just a small amount out of the bulk spices. Very inexpensive that way. Before I go, I wanted to tell you about my friend Ashley. She writes a blog called Center Cut Cook. She has lots of good recipes like her Roasted Garlic Parmesan Broccoli or her Cauliflower Popcorn. We met through the blogging world and she has always been super helpful. Why I am telling you about her? Well her husband Ryan has been diagnosed with colon cancer at the young age of 29. So, a bunch of bloggers decided to create a fundraiser to help her out with the enormous amount of medical expenses that comes along with cancer treatment. Even if you could only spare $1, it would help them. If you can’t spare anything, you can go to the site and give her virtual hugs. I know both Ashley and Ryan would totally appreciate it. Thanks and I hope you enjoy the recipe! 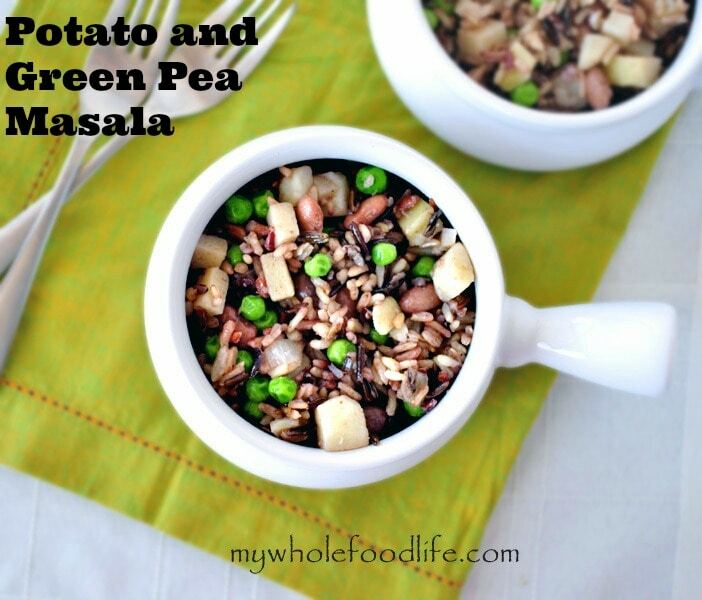 As someone who LOVES Indian food and is obsessed with green peas, this sounds awesome!! Yay! Thank you Hannah! I hope you enjoy the recipe. Just made this tonight! My husband is from Bangladesh and he loved it. Pretty easy to make if you have beans and wild rice already made (frozen!). As a clean eating newbie, I am loving your blog and the recipes. Thank you. Is it right to assume the beans are to be drained and rinsed? What can I sub out for the oil? You can just omit it.